Fortunately, Lloyd only got the accent wrong. “Shrimp on the Barbie” was a catch phrase that grew out of the smash-hit 1986 film “Crocodile Dundee” starring rugged Australian Paul Hogan. 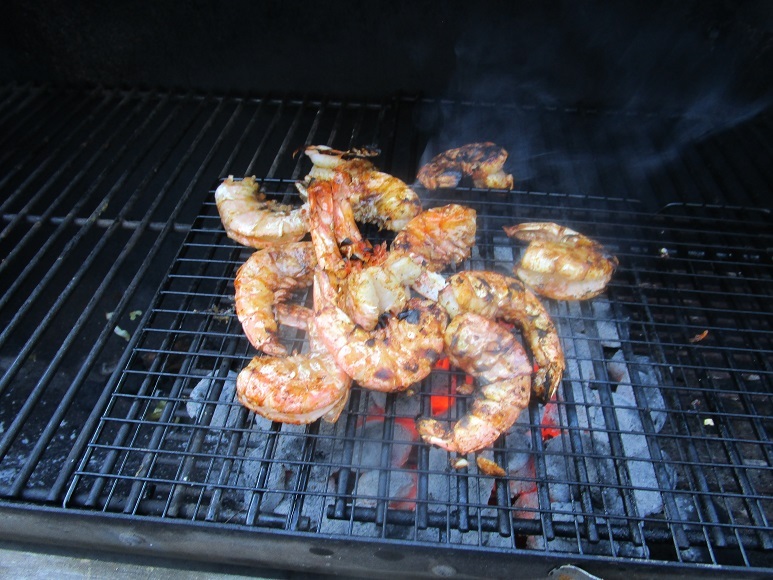 Yet Australians and Austrians alike, folks the world over for that matter, share a taste for shrimp grilled over an open flame. Summer is the perfect time to introduce our latest Cook-off, eG Cook-Off #70, Shellfish Grilled Over an Open Flame. (Click here http://forums.egulle...cook-off-index/ for the complete eG Cook-Off Index). Culinary definitions aside, never restrain yourself when it comes to creativity during a Cook-Off. While grilled lobster with drawn butter is a classic, what about grilled lobster with smoked paprika butter and grilled pineapple salsa? A new take on grilling shellfish. I for one am stocking my grilling pantry with the fixings of a spicy Northwest seafood stew—clams, mussels, Dungeness crab, prawns, salmon and halibut—all cooked over an open flame. I’m also pondering a bowl of steaming miso broth, thick rice noodles and grilled oysters. As for the fire? In the Pacific Northwest we favor alder and fruitwoods for a flavorful yet mild smoke that allows the seafood to be the star of the dish. If briquettes or propane flames your fire, Bob’s your Uncle. 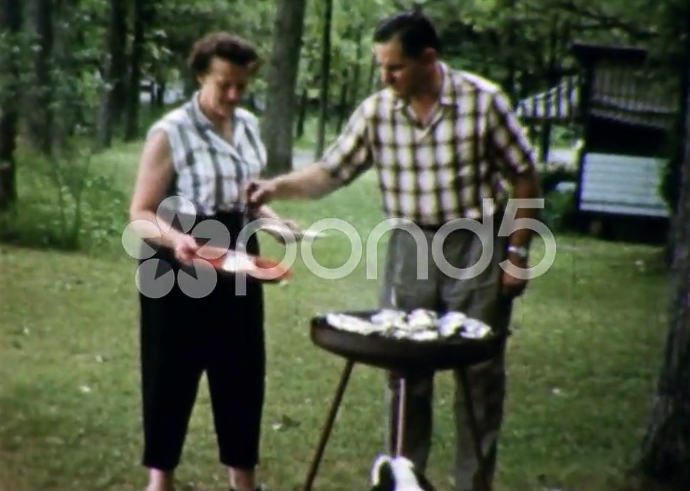 My Father (not the poor fellow in this video), wrapped shellfish and salmon in foil and put it on the barbecue. We were having “barbecued” seafood for dinner. For years I wondered, “what’s the point?” We were simply steaming sweet, succulent Oregon shrimp in foil with lemon and butter. It was delicious for sure, but I wondered where the “barbecue” flavor was coming from. I wouldn’t think of wrapping shellfish in foil today—I want that char, those blackened, caramelized bit, that smoky flavor to come through when I grill shellfish over an open flame. Go clam digging. Trap a crab. Net some crayfish. Visit your fishmonger. Let’s grill some shellfish. 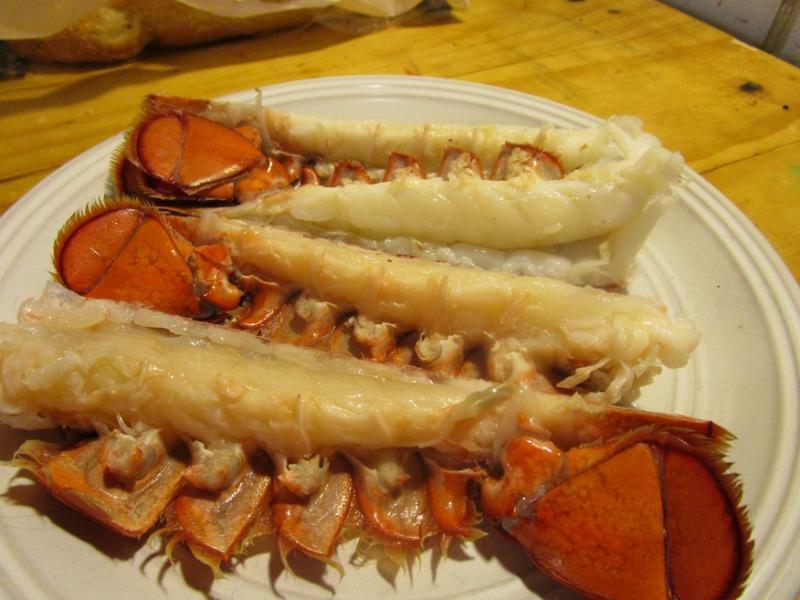 For grilling lobster, would you buy live lobsters and take them straight to the grill or would you steam them first, split them down the middle, then grill over your open flame? Too many ideas running through my head. So anyone have experience grilling oysters? I know they don't take too long, just until they open. I'll be adding some wood chips to the fire for smoke, but I may let them go a bit farther than just opened in terms of doneness. 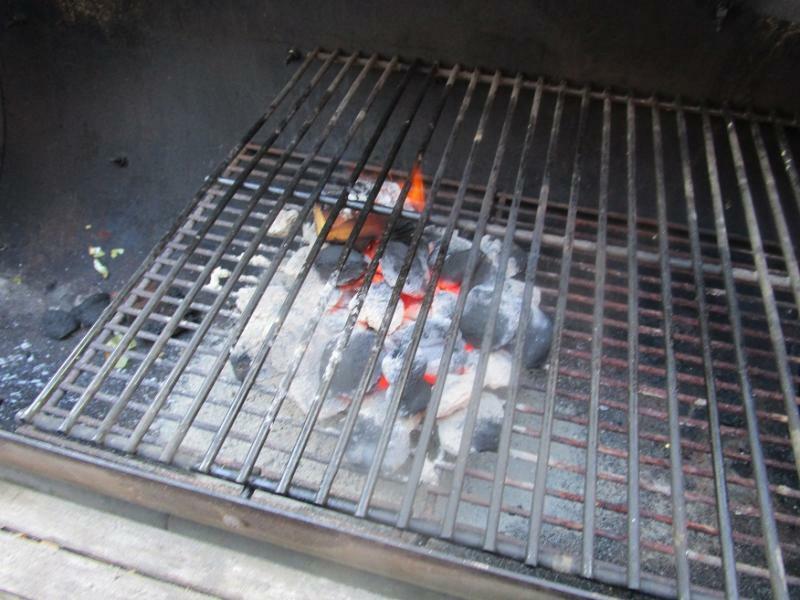 Anyone have experience grilling tomatoes over an open flame? I know it will probably take a vegetable basket for the grill, maybe something underneath that to trap juices. I'm thinking of fire-grilled oysters and something with smoked tomatoes. I think (at least from experience in a friend's backyard) that lower, indirect heat is better for outdoor oyster cooking. And months with an "R" are even better. I have done tomatoes on the grill following Marcella Hazan's directions as part of her recipe for charcoal broiled vegetables. She has you halve the tomatoes horizontally, place on the grill for a few minutes until the flesh is charred, then turn and cook until the skin is charred and they have shrunk by half. She has you season them with salt, olive oil, garlic, parsley and breadcrumbs after turning while they're still on the grill. The recipe also includes grilled onion, zucchini, peppers, eggplant and mushrooms. It would be a very nice addition to a grilled shrimp dinner. yesterday about grilling heirloom tomatoes with a Mexican treatment at post 122. Looks like he sliced his. I've grilled oysters too, and I did it on a hot fire directly on the grill just until they open, but I like my oysters on the raw side. Unfortunately, weinoo's right about the "R" months, at least for NC oysters, which is mostly what we can get around here. Thanks for the tips. I'm definitely going to grill some tomatoes to use as a garnish or in a sauce for some grilled shellfish. David - I've also frequently seen folks grilling lemon halves cut side down to squeeze over top. 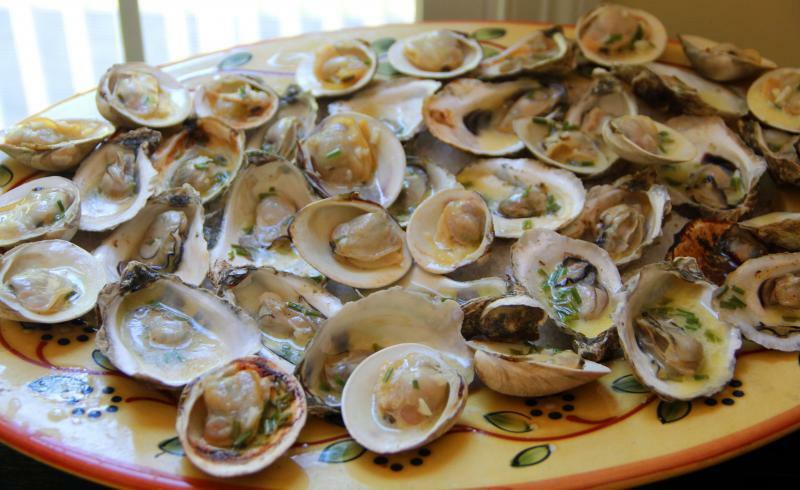 I frequently grill clams and oysters in the summer. I have a special grilling grate (it's actually called a Great Grate), that has triangular openings that are perfect for nestling the shells in to and holding them. I don't have the patience to shuck before grilling, so I put them on the grill whole, and as soon as they start to open I carefully shuck them while wearing a heavy glove. Then I return them to the grill and pour over some garlic butter and cook just until the butter starts to bubble. 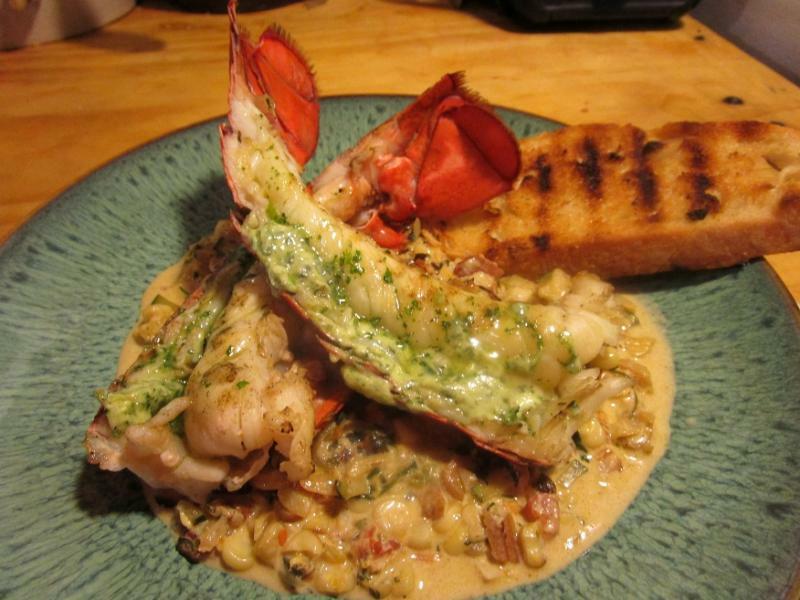 I tried to find a picture of them on the grate so you could see the design, but the only ones I could find with the shellfish on the grate had me in them, so here is a photo of them on the platter for serving. I put rock salt on the platter to keep the shells from spilling their liquor. That's a great dish for the Cook-Off, thanks! OK, this weekend I'll be grilling large wild American prawns served with a tomato-bacon relish and then a grilled lobster dish. My first thought was chicken feet on the grill, and that sounded messy. I'm guessing now that the chickeny bits will go to making a nicely gelled base for the relish. There, I've stuck my foot neck out in public. I knew the chicken feet would throw a monkey into the mix. You've got the gelled bits correct. 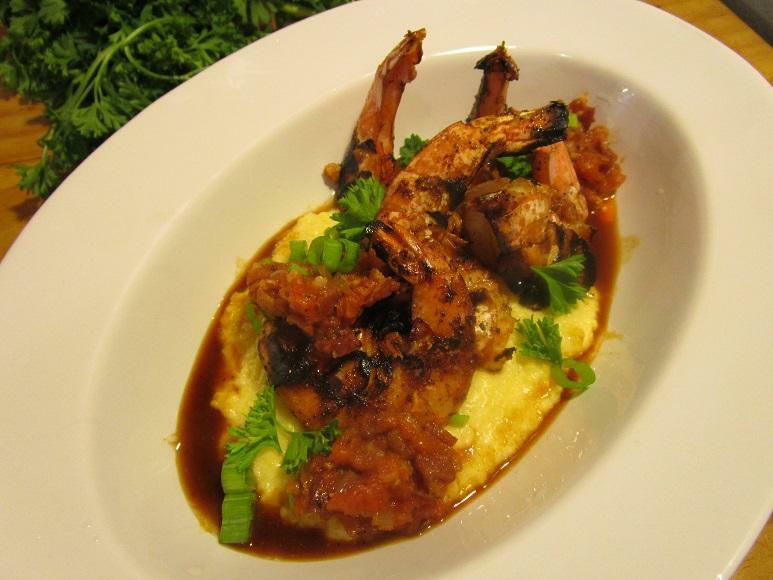 I'm making a rich chicken jus, on the stovetop, today to drizzle over some grits, and topped with grilled wild American shrimp and tomato-bacon relish. I guess my take on shrimp and grits. 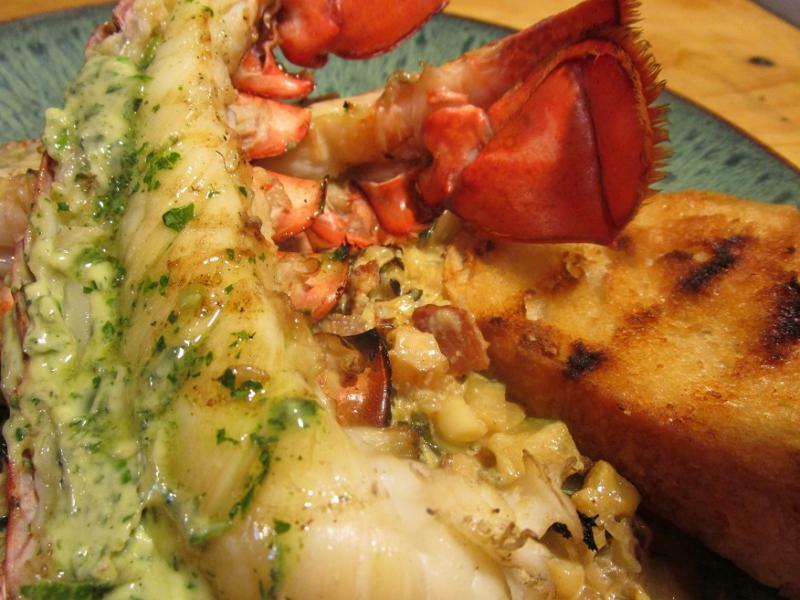 For my first dish I grilled lobster tails and served them with a chile-lime-cilantro butter and then I made a grilled corn, zucchini and razor clam chowder. 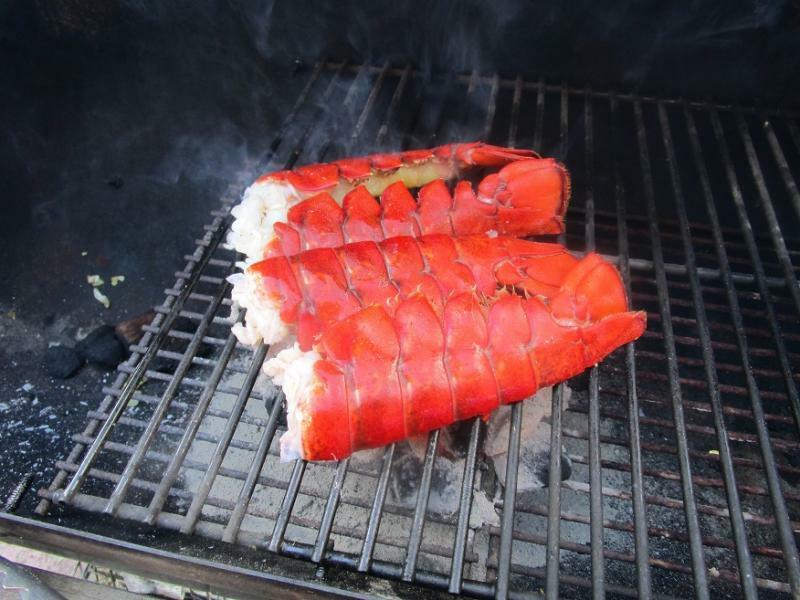 I've never grilled lobster over an open fire, so I was a little apprehensive. Didn't want it to be over-cooked and rubbery, and I wasn't sure if chucking it raw on the hot grates would char it on the outside yet leave it raw on the inside. 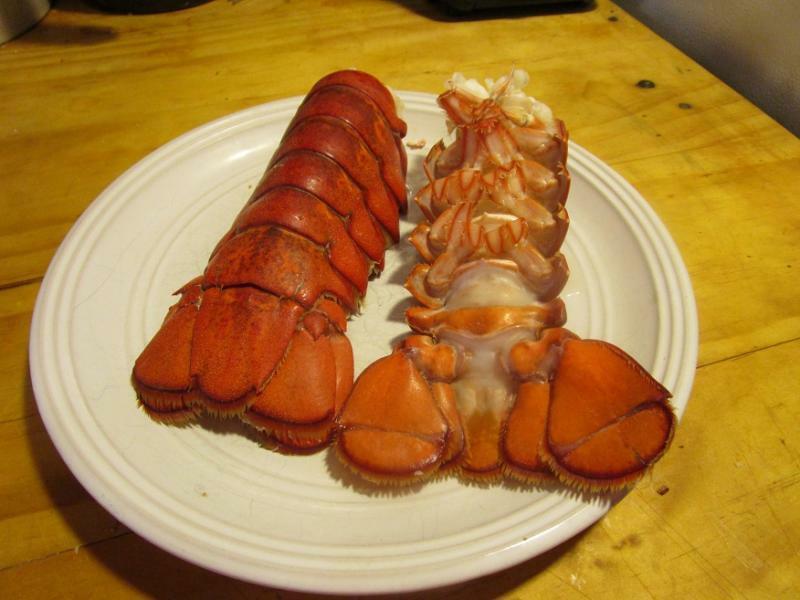 I let the lobster tails cool then started on the butter and chowder. The butter was simply a stick, 1/2 cup, of salted butter. Softened and then mixed with the zest of one lime, about a 1/2 cup of finely minced cilantro, 1/2 of a finely minced jalapeno chile, a bit of pepper and then chilled. This happens to be my barrel smoker, but I sometimes put charcoal in the barrel, (usually wood goes in the offset firebox), put a grate on top and use that for a very hot fire for grilling. I'd say the fire was about 4" away from the food. I used a combination of briquettes studded with mesquite and a few mesquite hardwood chunks soaked in water to create some smoke. I then cut the grilled vegetables in about a 1/4" dice and cut the corn off the cob. 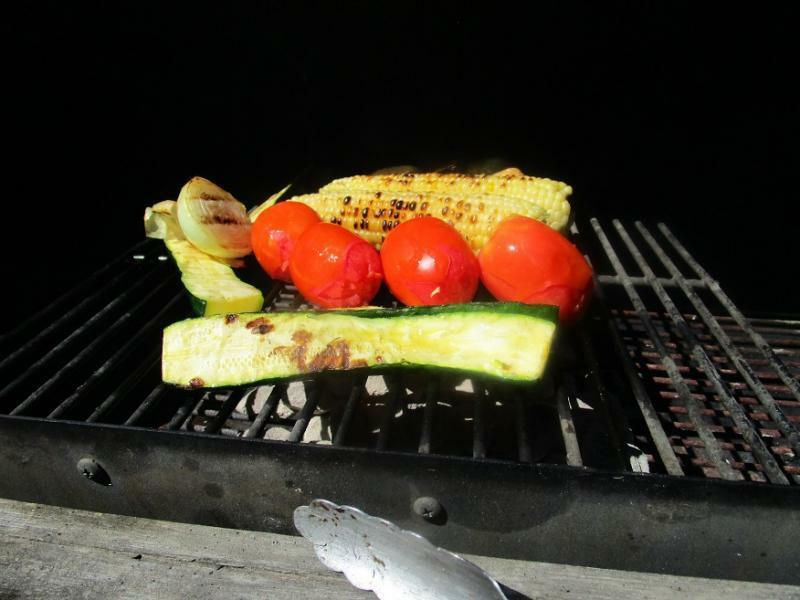 In a hot cast iron skillet, I drizzled in olive oil then added the onion, about 3 cloves of chopped garlic, a chopped jalapeno, (I prefer jalapenos raw rather than roasted over the fire), the corn, zucchini and tomatoes. I had three large razor clams in the freezer, so I chopped them up and added them with their clam juice to the chowder. A shake or two of dried chile powder, about a tablespoon of dried Mexican oregano and a dash of dried red pepper flakes. Then a good dose, I'd say about a cup, of heavy cream. Oh, and about four pieces of chopped bacon left over from breakfast along with a tablespoon of the rendered bacon fat. Cooked down while the lobster was on the grill. It was a very good dish. And the heavily buttered bread was wonderful for dipping into the chowder juices. I think the lobster could have used about a minute longer on the grill, but it was very flavorful and well worth the cost. Next up, some shrimp on the barbie. I'm not sure how Paul Hogan cooked his shrimp on the barbie, but I did a take on Shrimp n'Grits--the shrimp being grilled over the open flame. 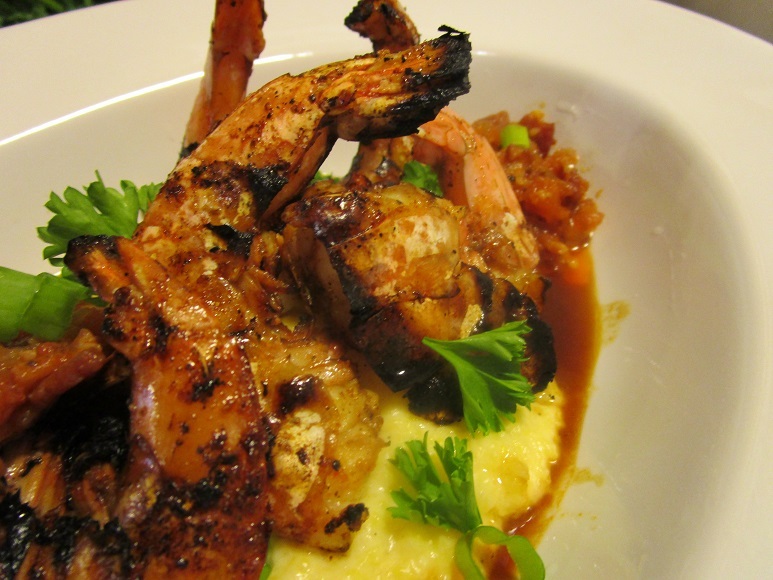 The other elements of the dish were a tomato-bacon relish, dark chicken jus and grits with lots of cheddar cheese. The tomato-bacon relish, or thick jam, can be made a day ahead. Saute some smoked bacon, then add diced red onion, garlic, skinned and seeded, diced tomato and cook down. I added a bit of diced jalapeno, a few drops of liquid smoke, tabasco, smoked paprika, brown sugar, apple cider vinegar and salt and pepper. If it gets too thick you can thin it with some water. The grits were a basic recipe using coarse corn grits from Bob's Red Mill of Portland. Instead of all water for the liquid I used half milk to half water. Seems to make the grits more creamy and a good measure of grated cheddar cheese. The dark chicken jus was a three-day process starting like you would for chicken stock-roasted chicken parts, carrot, celery, onion, parsley, bay leaves, peppercorns, garlic and water. I used about 20 cups of water to 3lbs. of chicken parts-wings and chicken feet. The feet go in raw to add gelatin to the jus. I roasted the wings for about 30 minutes to get them browned and then into the pot. Simmer for about 5 hours and strain. Chill and on day two back into the pot to reduce, adding about 2 tbsp. of tomato puree. Reduced down to about 2 cups and chilled overnight on day two, then back into the stockpot on day three. The final simmer reduces the jus to about 3/4 cup. I suppose you could call it a chicken glace over a jus.